Sometimes what looks like life isn't, and what definitely is life cannot be clearly confirmed by remote instruments. These are just two of the lessons a group of planetary scientists, robotics engineers, geologists and microbiologists are learning in the first field tests of the Life in the Atacama project. This so-called "terrestrial astrobiology" venture is probing the hyper-arid Atacama Desert in Chile to test the limits of life on Earth and to develop instrumentation to search for life on Mars. Hyperion, an autonomously operated robotic rover, travels across the Atacama Desert in Chile, testing the limits of life. Researchers hope to gain insight into potential life on Mars. Photo courtesy of Carnegie Mellon University. "We saw a bunch of rocks with a green film that we just assumed was lichen at first," says Alan Waggoner, a professor of biology at Carnegie Mellon University and director of the Molecular Biosensor and Imaging Center. But he and his colleagues looked at it with a fluorescence microscope, and it did not glow as lichen would. "We were confused until a geologist on the team took a look and said it was just a mineral coating," Waggoner says. Indeed, the green color came from copper deposits in the nearby mountains. In this instance, instrumentation trumped human eyesight, but that is not always the case; sometimes, the eyes have the advantage. Despite partial spectroscopic evidence of chlorophyll, microbiologists could not detect lichens and evidence of bacteria colonies in the desert with instrumental readings. They could, however, see these life-forms first-hand on a walk through the desert. Nevertheless, researchers have set the standard of "unambiguous confirmation" of life via instrumentation as their goal. Exactly what that means and how much evidence is necessary is something they are debating as they proceed with field trials. Because no humans will be traveling to Mars soon, and because of the high level of skepticism that will no doubt greet any claim of life on other planets, such instrumental evidence is key, said researchers at a July project meeting at Carnegie Mellon. 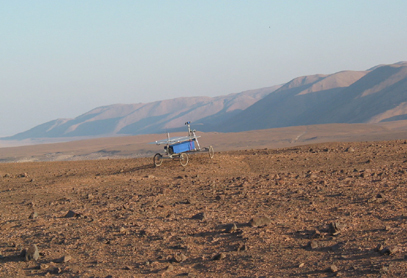 For this first field campaign, researchers from NASA, Carnegie Mellon and the University of Tennessee descended upon the Atacama Desert in April 2003. They brought a robotic rover called Hyperion to carry instruments over long distances, spectrometers to identify minerals and detect chlorophyll in the soil, and imaging systems to monitor fluorescence from minerals, plants and microbes illuminated by light-emitting diodes. The workhorse of the project, Hyperion, is a sun-seeking, shadow-dodging solar powered robotic rover developed under the direction of William L. "Red" Whittaker at Carnegie Mellon (Geotimes, August 2003). Given a general path to traverse, Hyperion autonomously plots a route around shadows to maintain its energy levels. In a power emergency, it might head for high ground and bask in the sun for a while to restore its depleted energy reserves. In five days of field testing, Hyperion traveled 21 kilometers, double the distance its creators expected. It followed a path chosen from satellite images for its promise of life, based on geological features that indicated previous water flow patterns. The rover analyzed 27 samples taken at programmed distance intervals; it found 12 that showed possible chlorophyll content based on visible/near-infrared spectra. But the researchers have yet to use their strongest weapons: four dyes that fluoresce only when chemically bound to one of four biomolecules  nucleic acids, proteins, lipids and carbohydrates. One dye becomes 100 to 1,000 times more fluorescent when bound to DNA, Waggoner explains. A fluorescence of all four dyes when sprayed on a sample would indicate a very high probability of life. But the challenges of getting dyes through coatings on spores and through cracks in rocks that might house bacteria remain to be solved, and are currently the subjects of laboratory experiments. In addition to the search for life, the Atacama researchers mapped the mineralogy of the Atacama Desert, and measured solar influx and weather conditions as clues to the limits of life on Earth  to test how hot, dry and salty of an environment even the most robust microorganisms can survive. The researchers will return to the Atacama next year with an improved version of Hyperion and its life-detecting instruments. This time they will turn east into even drier regions of the desert where, Waggoner says, "the life forms are less obvious, and we will really have to count on our instruments."